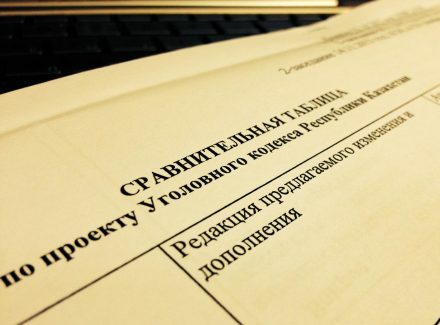 Next stage: will the death penalty remain in Kazakhstan’s new criminal code? On 24 October 2013 the General Prosecutor’s office in Kazakhstan presented a draft Criminal Code to parliamentarians. After the presentation and responses to questions of parliamentarians by the Working group on Criminal code at the Parliament (WG) led by the MP Nurlan Abdirov, it was decided that further discussion of the draft law would continue at subsequent meetings of the Working Group. On 19 November, Saule Mektepbayeva, Regional director of Penal Reform International office in Central Asia, and Dinara Dildabekova, Project coordinator of Penal Reform International office in Central Asia, participated in the meeting of Working Group. Representatives of the General Prosecutor’s office (authors of the draft law), MPs, state officials, lawyers as well as representatives of civil society took part. Two parts of the discussion were dedicated to the death penalty as a type of punishment and problem of the total abolition of the death penalty in Kazakhstan. The current draft law contains 16 crimes for which the death penalty is applicable. ‘I am against the death penalty and I think that existing of the death penalty in Kazakhstani law violates international law and Constitution of the Republic of Kazakhstan’, said Zhemis Turmagambetova, Executive Director of the Charter for Human Rights. ‘The death penalty should be abolished. In the post-Soviet area only Kazakhstan and Belarus have kept the death penalty; Tajikistan has introduced a moratorium on sentencing to the capital punishment’. ‘When we talk about the death penalty, there are two important issues to be taken into account. First of all, there is extradition. The existence of the death penalty in Kazakhstan is a main argument when other countries decline to extradite offenders to Kazakhstan. One of the cases where authorities in Poland have been refusing for a long time to extradite a criminal who is wanted by Kazakhstan, is mentioned in PRI report Counter terrorism in Kazakhstan: why the death penalty is no solution ’, said Saule Mektepbayeva, Regional Director of Penal Reform International in Central Asia. Johan Merkel, First Deputy to the General Prosecutor, said that the issue of a moratorium on sentencing to the death penalty would be discussed by the authors of the draft law. At the closing of the Working Group meeting, the moderator MP Abdirov concluded that there was no absolute common consensus on capital punishment and the Group would continue work on discussion and taking into account all arguments and opinions of members. PRI’s Office in Central Asia is a member of parliamentary working groups on the Criminal Code, Criminal Executive Code and Criminal Procedure Code. All draft codes were submitted to the Parliament on 16 October 2013.